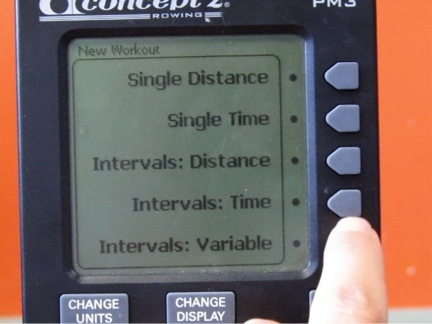 Learn how to use the Concept2 Performance Monitor! Setup a Renegade Rowing Workshop at your Gym! Remember, the goal is to row at max pressure for every piece. Focus on your split and stroke rate and row at high intensity with good form.Todays Rowing WOD calls for Max Pressure and is a test of your ability to consistently perform at your highest intensity, something everyone strives for in developing elite fitness. Set the monitor for Intervals Variable and input 1,250m , 5:30 rest, 1,250m, 5:30 rest, 700m, 3:30 rest, 700m, 3:30 rest, 300m, 1:30 rest, 300m, 1:30 rest. Pick a 500m Split and a Stroke Rating you plan to hold for each distance. The first time you perform that distance execute that pace (split and SR) as consistently as possible. When you repeat the distance try to be even more consistent and go a little bit faster. Post your average 500m splits to comments. This entry was posted in Rowing and tagged endurance sports, exercise, functional movements, mental toughness, rowing, sports, training by Renegade Rowing. Bookmark the permalink.